Tiny, portable utility Default Programs Editor makes short work of changing file associations, autoplay settings, and can even change the icon associated with a file type. Once you've launched the no-installation-required utility, you'll be presented with a slick wizard interface that walks you through editing your autoplay, default programs, or file type settings. 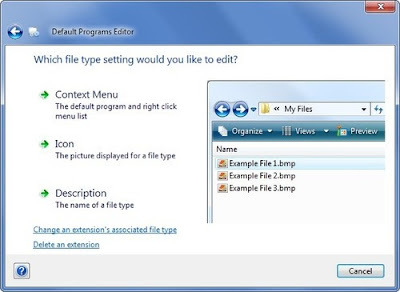 Under the file types you can edit the actions on the context menu, change the description, or even change the picture that is displayed as the file type icon. Once you are done editing, you can even save your changes as a .reg file, so they could be exported to another PC. It's a powerful, slick utility that probably should have been included in Windows by default.